Why suffer from metal detector belt stops and take chances with tramp metal if you don't have to? Unlike a magnet, the MARSTM removes all types of metal. 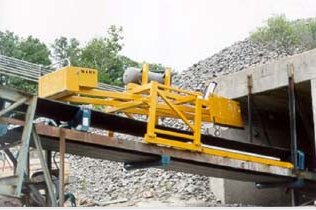 Unlike a metal detector, the MARS automatically removes the metal without stopping the belt (no downtime, no human error). In fact, the MARS is so cost effective, it typically pays for itself in less than a year! Increased Productivity: Produce the same amount of materials in less time. Just two belt stops a day can result in a loss of over two weeks of production a year. And tramp metal related equipment breakdowns can result in several hours or even days of downtime. Intermittent belt stops and unscheduled downtime can affect the rhythm and efficiency of the entire plant. The MARS eliminates metal detector belt stops and automatically protects expensive processing equipment from tramp metal. Increased Capacity: More production, more sales, more profit. Since the MARS eliminates the downtime associated with metal detector belt stops and equipment breakdowns, it gives the plant more time to produce product. Increased production means more sales and increased profit! Prolonged Asset Life: Protect processing equipment; increase the life of belts and motors. Tramp metal can cause significant damage to expensive processing equipment. Even though the equipment may be repaired, it may not perform as well or last as long. Unlike magnets, the MARS removes all types of metal. Unlike metal detectors, the MARS removes the metal automatically, eliminating human error. In addition, metal detector belt stops/starts stress belts and motors, especially when belts are loaded with material. The MARS eliminates these belt stops/starts, prolonging the life of belts and motors. Reduced Maintenance Costs: Eliminate tramp metal related breakdowns and repairs. Tramp metal related breakdowns can be expensive, including the costs associated with labor, replacement parts, auxiliary equipment, etc. Because the MARS automatically removes all types of metal, it protects expensive equipment from tramp metal that magnets and employees may miss. Improved Quality: Improve product consistency, tighten specifications, reduce waste. Even without a breakdown, tramp metal can affect the alignment and performance of processing equipment, resulting in off-sized production. Unlike magnets, the MARS removes all types of metal. Unlike metal detectors, the MARS removes the metal automatically, eliminating human error. Improved Service: Eliminate equipment breakdowns, improve plant reliability. Metal related equipment breakdowns and repairs result in unscheduled downtime, potentially affecting the plant’s ability to service its customers as promised. Because the MARS automatically removes all types of metal, it protects expensive equipment from tramp metal that magnets and employees may miss. Improved Safety: Reduce potential for injury. Injuries can occur when employees manually remove metal from conveyor belts, especially during inclimate weather (rain, snow, poor visibility, etc.). Regulators have also voiced concerns about this practice, especially regarding lock-out/tag-out procedures. Injuries can also occur during the repair of equipment damaged by tramp metal. Once again, because the MARS automatically removes tramp metal, it reduces the risk of injuries, workman’s comp and fines. Improved Plant Performance: Reduce costs and increase profits. All the benefits of the MARS described above reduce plant operating costs, resulting in savings that flow directly to your bottom line! MARS usually pays for itself in less than one year.